362-366 Commonwealth are located on the SE of Commonwealth and Massachusetts Avenues, with 360 Commonwealth to the east, 370 Commonwealth to the west, across Mass. Ave., 355 Commonwealth to the north, across Commonwealth, and 359 Newbury to the south, across Alley 430. 362 Commonwealth, a 6-unit apartment house, and 364-366 Commonwealth, a 10-unit apartment house, were designed by Richards and Richards, architects, and built in 1889-1890, by Thomas R. White, mason. Although built as two buildings, 362 Commonwealth and 364-366 Commonwealth were operated as one building and have been owned in common since they were built. When they were first built, they briefly were called The White House. By 1898, 366 Commonwealth was known as The Commonwealth and by 1905 both buildings were known by that name. The two apartment houses originally were owned by the builder, Thomas White, and his wife, Henriette (Kurrus) White. Thomas White is shown as the owner of 364-366 Commonwealth on the original building permit application, dated August 12, 1889, and on the final building inspection report, dated December 17, 1890, Henriette K. White is shown as the owner of 362 Commonwealth on the original building permit application, dated March 20, 1890, and on the final building inspection report, dated December 17, 1890 (floor plans of a typical floor in each building are bound with the building inspection reports, located in the Boston Public Library’s Arts Department; the drawing for 364-366 Commonwealth could not be copied because of water damage). In his Houses of Boston’s Back Bay, Bainbridge Bunting indicates that 362 Commonwealth was built in 1889 and was a 10-unit building, and that a second 6-unit building was built at 366 Commonwealth. However, the original building permits, final inspection reports, and deeds indicate that a 6-unit building was built at 362 Commonwealth, and a 10-unit building at 364-366 Commonwealth. Thomas White purchased the land for 362 and 364-366 Commonwealth in two transactions. 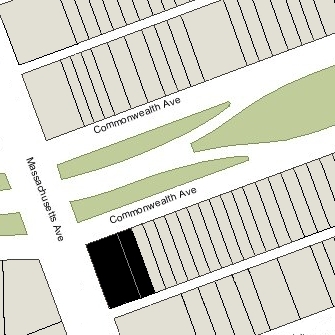 He purchased the corner lot, with a 30 foot frontage on Commonwealth, on August 7, 1899, from Luther D. Shepard, and the lot to the east, with a 55 foot frontage, on September 20, 1899, from Silas W. Merrill. Both lots previously had been owned M. Woolsey Borland. He had purchased the land on April 20, 1881, from Frederic Amory (a 32 foot lot) and his brother, Harcourt Amory (a 54 foot lot). M. Woolsey Borland sold the western one foot on December 4,1883, to George Wheatland, Jr., who combined it with a 20 foot lot he acquired from Jacob Rogers and built 360 Commonwealth on it. M. Woolsey Borland subdivided the remaining 85 feet into the 30 foot lot on the corner and the 55 foot lot to the east. He sold the corner lot to Luther D. Shepard on December 1, 1885, and the 55 foot lot on February 8, 1886, to James S. Gill. The 55 foot lot subsequently changed hands and was purchased by Silas W. Merrill on February 28, 1889. Frederic Amory and Harcourt Amory acquired the land in March of 1879 from David N. Skillings. It was part of a parcel David Skillings purchased from the Boston Water Power Company on April 19, 1870, as trustee for a trust composed of himself, Lawrence Barnes of Burlington, Vermont, Charles Whitney of Lowell, and David Whitney, Jr., of Detroit. The land had subsequently changed hands and he had re-acquired it, in his own name, on January 12, 1878. Click here for an index to the deeds for 362-366 Commonwealth, and click here for further information on the land on the south side of Commonwealth between Hereford and Massachusetts Avenue. While the buildings were under construction, Thomas White transferred them into his wife’s name: on September 25, 1889, he transferred 364-366 Commonwealth on a 57 foot 6 inch lot, and on February 12, 1890, he transferred 362 Commonwealth on a 27 foot 6 inch lot. 364-366 Commonwealth was completed in 1890 and the first residents had moved there by the 1890-1891 winter season. 362 Commonwealth was completed by the next season and Thomas and Henrietta White had moved to one of the apartments. They previously had lived at 420 Newbury. 362-366 Commonwealth was called The White House in the 1891-1892 Blue Books, but no longer was referred to as such by the 1893 edition. To finance the buildings, Thomas and Henrietta White entered into a series of mortgages, including five with Nathan Matthews. On March 24, 1890, they refinanced the mortgages, consolidating them into two mortgages, one for $30,000 and the other for $65,000. Nathan Matthews assigned the $30,000 mortgage to George E. Howe. Although both mortgages were secured by the entirety of 362 and 344-366 Commonwealth, it appears that the amounts represented the relative value of the two buildings. On September 24, 1891, George Howe foreclosed on the $30,000 mortgage, and on March 19, 1894, Nathan Matthews foreclosed on the $65,000 mortgage. On April 5, 1894, the Whites filed suit against Nathan Matthews and on April 7, 1894, they transferred their residual equity interest in the property to Charles G. Fall (their attorney) as trustee on their behalf. The suit was decided in Nathan Matthew’s favor, and on November 2, 1894, the Whites transferred their interest in 362 Commonwealth and 364-366 Commonwealth to him. On December 31, 1894, Nathan G. Green, successor trustee to Charles Fall, transferred the residual interest he held to Nathan Matthews. The Whites had continued to live at 362 Commonwealth during the 1893-1894 winter season, but moved thereafter to 16 St. Germain. By the 1898 Blue Book, 366 Commonwealth (but not 362 Commonwealth) was referred to as The Commonwealth. George Howe continued to hold an interest in the property as mortgagee in possession as a result of his foreclosure in September of 1891. On May 12, 1902, he transferred his interest to Nathan Matthews. On the same day (by a deed recorded April 13, 1903) he transferred the property to his son, Nathan Matthews, Jr., and to George Howe. 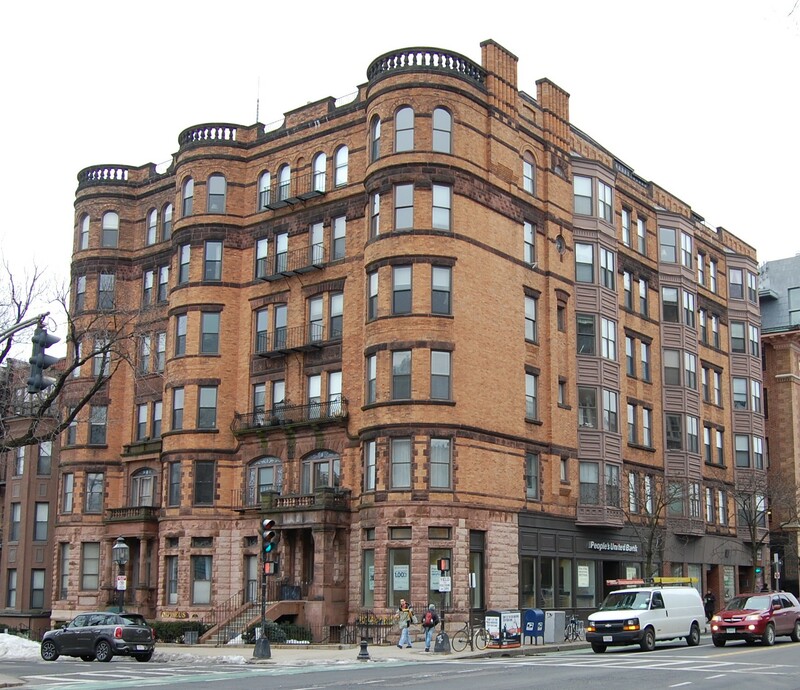 In addition to residential apartments, 364-366 Commonwealth also included commercial space on Massachusetts Avenue. Among the non-residential tenants from about 1892 to 1900 was Carro Morrell Clark, who operated a stationery and variety store, and later a dry goods store. 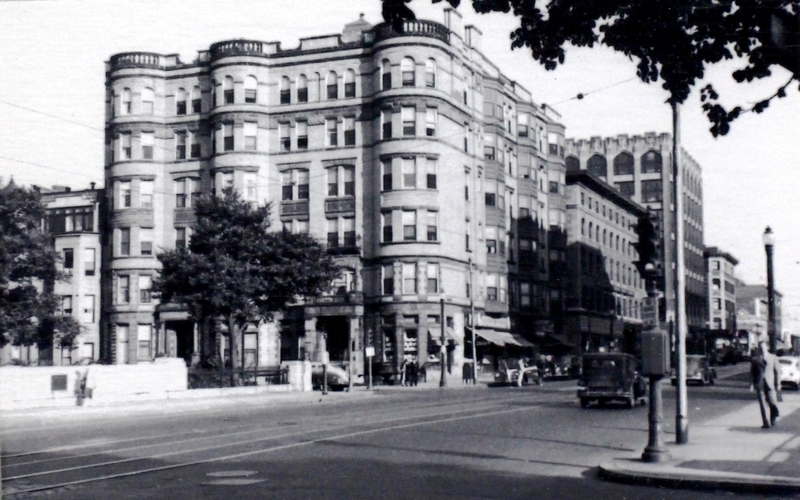 She was a lodger at various locations until August of 1897, when she married Charles F. Atkinson, manager of the Bowdoin Square Theatre; after their marriage, they lived at 848 Beacon. In 1900 she founded the C. M. Clark Publishing Company, credited as being the first woman-owned publishing company in the United States. Soon after founding the business, she moved it to 185 Summer and then to 211 Tremont. The firm was disbanded in 1912, and she and Charles Atkinson divorced in 1913. In 1914, she married Leon Henry Lempert, Jr., an architect from Rochester, New York, noted for designing theatres. In later years, Carro (Clark) Lempert authored a series of children’s books under the name Carro Frances Warren. On February 15, 1905, 362-366 Commonwealth was acquired from Nathan Matthews, Jr., and George Howe by William H. Lincoln and Joseph Benjamin Moors. After they acquired the buildings, both buildings were known as The Commonwealth. Joseph Moors died in April of 1909, and his interest was held in a trust established under his will. On January 15, 1919, the trust distributed it to his five surviving children: Arthur Wendell Moors; John Farwell Moors; Francis Joseph Moors; Maria Buckminster (Moors) Cabot, the wife of Godfrey Lowell Cabot; and Adelaide (Moors) Brown, the wife of William Henry Brown. On the same day, Arthur Moors and Francis Moors acquired their siblings’ interests. On March 25, 1924, real estate dealer George J. Wilson acquired William Lincoln’s interest in 362-366 Commonwealth, and on April 1, 1924, he acquired Arthur and Francis Moors’s interest in the property. On September 4, 1924, 362-366 Commonwealth was acquired from George Wilson by George F. Welch. On March 30, 1926, he transferred the property to himself, Thomas B. Alexander, and William B. James, as trustees of the George F. Welch Trust. The property changed hands and on March 3, 1959 was acquired by Reith-Spiegel, Inc. In June of 1959, it applied for (and subsequently received) permission to remove the existing front entries and make a new, single entrance at 362 Commonwealth. The change in the entrance apparently was not made and,, in 1962, Leah Realty, Inc., successor to Reith-Spiegel, filed for approval to consolidate the buildings as one property and create a single entrance at 362 Commonwealth. The application was denied by the Building Department and Leah Realty appealed to the Board of Appeal. On April 30, 1962, 362-366 Commonwealth was acquired from Leah Realty by the Arlford Realty Corporation. On May 25, 1962, the Board of Appeal issued a decision on Leah Realty’s appeal allowing consolidation of 362-364-366 Commonwealth as a single property but required that there be at least two entrances, one at 362 Commonwealth and the other at either 364 or 366 Commonwealth. In the decision, it indicated that 362 Commonwealth consisted of 9 apartments, 364 Commonwealth consisted of 20 apartments, and 366 Commonwealth consisted of 11 apartments and 5 retail stores, which the appellant was converting into 15 apartments and retail stores. The resulting occupancy of 362-366 Commonwealth was 44 apartments, 5 retail stores, and 1 real estate office. In October of 1974, Arlford Realty filed for (and subsequently received) permission to legalize the occupancy as 81 apartments, 5 stores, and 4 offices. In November of 1974, it filed to modify the occupancy by converting one of the stores into a launderette. On February 4, 1977, the First American Bank for Savings foreclosed on a mortage given by the Arlford Realty Corporation and took possession of 362-366 Commonwealth. On June 15, 1977, 362-366 Commonwealth was purchased from the First American Bank for Savings by Frederick W. Rust, III, trustee of the 362 Commonwealth Trust. In July of 1977, he filed for (and subsequently received) permission to convert one of the stores into a restaurant, so that the occupancy became 81 apartments, 3 stores, 4 offices, 1 launderette, and 1 restaurant. On July 27, 1981, 362-366 Commonwealth was purchased from Frederick Rust, III, by 362 Commonwealth, Inc. Frederick Rust, III, was the treasurer of 362 Commonwealth, Inc., and his wife, Louise D. Rust, was the president. In February of 1980, prior to acquiring the property, 362 Commonwealth Inc. had filed for (and subsequently received) permission to convert the property into 59 apartments, 3 stores, 2 offices, 1 launderette, and 1 restaurant. On September 4, 1981, 362 Commonwealth, Inc., converted the property into 61 residential condominium units and six commercial condominium units, the Commonwealth Condominium.